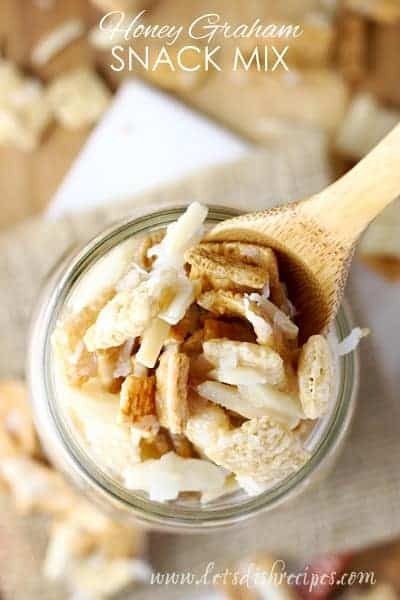 HONEY GRAHAM SNACK MIX — Chex and Golden Grahams cereal with almonds and coconut, in a sweet candy coating. Perfect for holiday gift giving! I love making snack mix for the holidays. And while I usually go for the savory stuff, this Honey Graham Snack Mix is one of my family’s favorites! I should probably warn you, I could eat all 14 cups of this stuff by myself. It’s kind of addicting. Dangerously addicting. If I were you, I’d plan on giving some away. Just package it up in a cellophane bag and tie it with a pretty ribbon. Trust me, your friends and neighbors will love you for it. And if you’ll be sending care packages this holiday season, this snack mix travels well too. 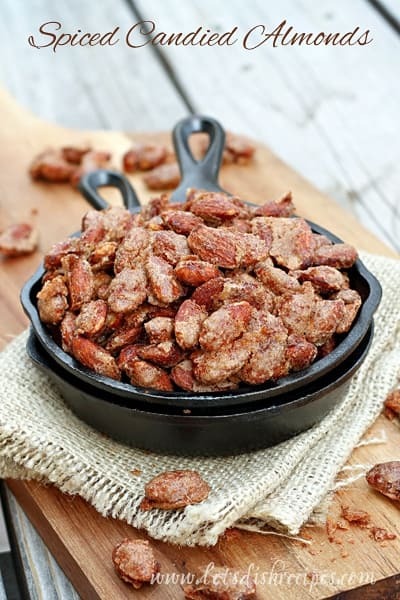 I like to use peanuts or slivered almonds in the recipe, but any type of nuts (or no nuts at all) will work. And if you don’t like coconut, you can leave that out too. Store brand Chex cereals work just fine in this recipe, but the store brand Golden Grahams tend to go soggy. The name brand version stays nice and crunchy, so I don’t usually skimp there. The candy coating on this snack mix is meant to be a little chewy, so don’t overcook it or it will harden into one solid mass. Unless, of course, you prefer it extra crunchy. Personally, I’d eat it either way. I literally have to have my husband hide it from me so I don’t eat too much! 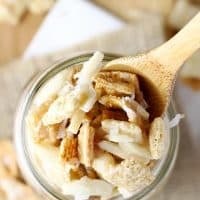 If you’re looking for a sweet, candy-like snack mix to add to your recipe collection, then this is the snack mix for you! 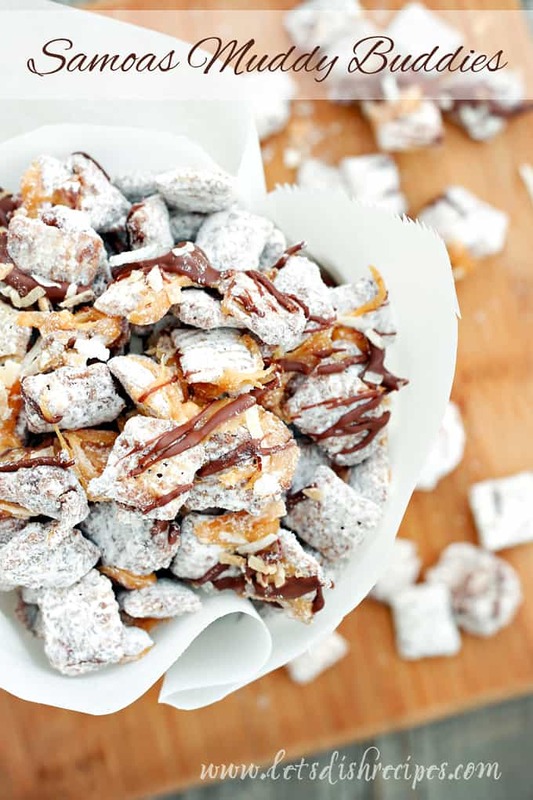 Be sure to save this Honey Graham Snack Mix recipe to your favorite Pinterest board for later. 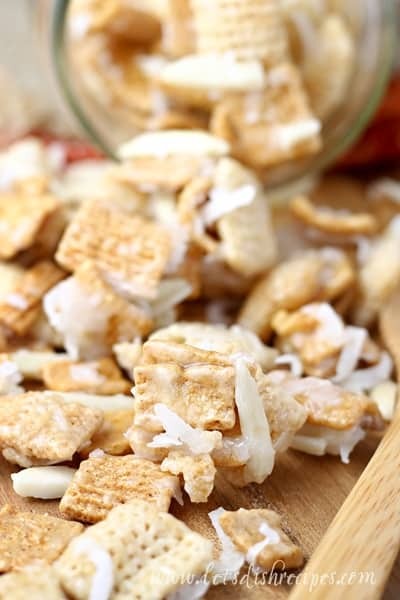 Chex and Golden Grahams cereal with almonds and coconut, in a sweet candy coating. Perfect for holiday gift giving! Place cereals, nuts and coconut in a large bowl. In a medium saucepan combine the butter, corn syrup and sugar. Stirring occasionally, bring to a boil over medium heat. Boil for 2 minutes. Pour immediately over the cereal mixture and stir to combine well. Pour onto wax paper lined baking sheets to cool, then break into bite size chunks. Who Dished It Up First: I got this recipe from my friend Micah. I made a snack mix almost identical to this this summer and it was SO good! No one could keep their hands out of it! Okay, no raisins. I’m in! Looks good. what an awesome snack mix! I will definitely give it a try! I am a new follower! I made this for a teacher gift for Christmas one year and three years later when another child had the same teachers, the first thing they told me at back to school night was that they were excited to have my kid and hoped I would have the same Christmas gift for them. This recipe is memorable!